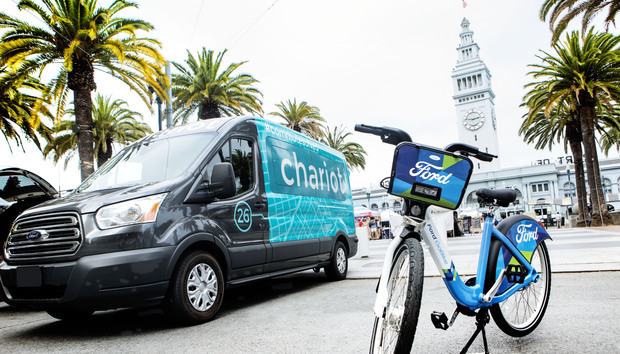 Ford today announced it is acquiring Chariot, a San Francisco-based commuter ride-sharing shuttle startup that will become part of a plan by the carmaker to address growing urban congestion. Ford also announced it is collaborating with Motivate, a bike-sharing service, in order to offer create that "Ford GoBike" sharing service across San Francisco and the Bay Area. Ford and bike-sharing service Motivate are working to add new bicycle stations and to increase the number of bikes to 7,000 in the Bay Area by the end of 2018. Motivate, which offers its service in 12 cities around the world, has designed an app for bike-sharing users. The Motivate app allows users to unlock bikes in docks and provides real-time information about ride availability. The Ford acquisition and partnership is part of a plan by the carmaker to address the "challenges tied to moving people and goods around" in ever more congested cities. "We're expanding our business to be both an auto and a mobility company, and partnering with cities on current and future transportation needs is the next major step," Ford CEO Mark Fields said in a statement. "For more than 100 years, Ford has been part of the community and the trusted source for automotive transportation. Now, we want to work with communities to offer even more transportation choices and solutions for people -- for decades to come." While today, about half the world's population lives in cities, by 2030, that number is expected to grow to 60%, according to Ford. At a news conference in San Francisco, Ford announced its new City Solutions team as part of its Ford Smart Mobility LLC. A Chariot ride-sharing van in San Francisco. Ford Smart Mobility LLC. includes the acquisition of Chariot, which the carmaker expects to expand beyond San Francisco to at least five additional markets in the next 18 months. Started in 2014, Chariot already operates nearly 100 Ford Transit shuttles along 28 routes throughout San Francisco Bay Area. "We started our Chariot service with Ford's 15-passenger vehicles and continue to use Ford Transit shuttles to this day," Ali Vahabzadeh, Chariot cofounder and CEO, said in a statement. "We couldn't be more thrilled to be Ford Smart Mobility's first acquisition and leverage its leadership in transportation to fulfill Chariot's goals worldwide." The Chariot service uses Ford's 15-passenger vans and a mobile app ride-hailing service. Today, Chariot's routes are crowd-sourced based on rider demand. In the future, they will operate dynamically -- using data algorithms to map efficient routes to best serve the real-time mobility needs of communities, Ford said. Ford and Motivate are also working to add new bicycle stations and increase the number of bikes to 7,000 in the Bay Area by the end of 2018. Launching next year, Ford GoBike will be accessible by users through the FordPass platform. FordPass is an app that combines payment services with ride-sharing and parking services such as ParkWhiz.